Legal Results: Medical Marijuana provides a general introduction to the topic of medical marijuana, as well as a more in-depth examinations of the legal issues typically surrounding the use of medical marijuana. 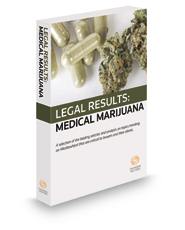 The reader will find information on the medical and other uses of marijuana, including the concept of “compassionate use.” In addition, information is available on the interplay between medical marijuana and the workplace, as well as more general land use considerations surrounding medical marijuana dispensaries. Moreover, this volume contains a full analysis on current medical marijuana laws and medical necessity defenses to marijuana laws and their respective judicial interpretations around the country. Likewise, a full nationwide analysis is provided on the propriety of an employer's hiring and firing decisions regarding employees using medical marijuana, as well as an illuminating article on the fine line between legal and illegal marijuana use. The pamphlet concludes with a number of forms relevant to municipal regulations of medical marijuana dispensaries.